Eleni Zimi learn about Eleni and her work! 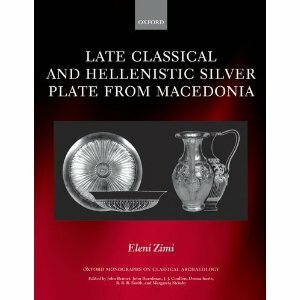 This is the first comprehensive and fully illustrated study of silver vessels from ancient Macedonia from the 4th to the 2nd centuries BC. These precious vessels formed part of dining sets owned by the royal family and the elite and have been discovered in the tombs of their owners. Eleni Zimi presents 171 artifacts in a full-length study of form, decoration, inscriptions and manufacturing techniques, set against contemporary comparanda in other media (clay, bronze, glass). She adopts an art historical and sociological approach to the archaeological evidence and demonstrates that the use of silver vessels as an expression of wealth and a status symbol is not only connected with the wealth spread in the empire after Alexander’s the Great expedition to the East, but constitutes a practice reflecting the opulence and appreciation for luxury at least in the Macedonian court from the reign of Philip II onwards.